On the afternoon of Sunday, January 27th, we did what few Christians of different denominations do: we came together for a joint worship gathering. 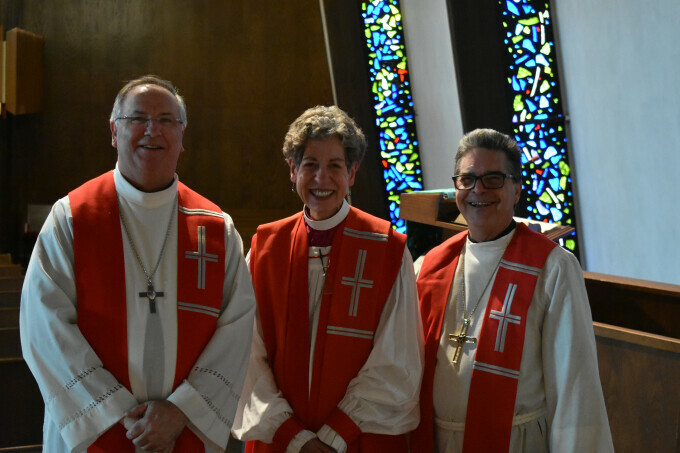 We were lead by Bishops John Dolan (Roman Catholic Diocese of San Diego), Katherine Jefferts Shori (Episcopal Diocese of San Diego) and Andrew Taylor (Pacifica Synod, Evangelical Lutheran Church in America). ... and Bishop Katherine delivered a message. ...and we renewed our commitment to each other as brothers and sisters in Christ. Our Bishop, the Rev. Dr. Andrew Taylor (center) was one of the worship leaders. Special thanks to those who helped coordinate the ecumenical gathering, including Rev. Karon Marohn of St. Peter's by-the-Sea Lutheran Church in Ocean Beach (right). You can watch the entire worship gathering below. Stories and conversation topics from our community of faith.